I hope you all have stayed safe during this weekend’s storm. I visited the campus earlier today and the buildings have power and everything inside is secured. Additionally, there have been several conference calls today with York County Emergency Management, local government, and the surrounding school districts. 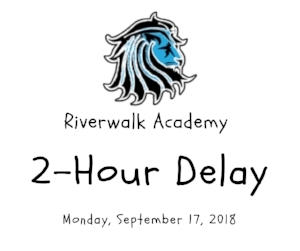 As a result of these calls, we believe it is best that Riverwalk Academy operates on a two hour delay on Monday, September 17, 2018. This means that our school day will begin at 10:00 am (middle and high school students will report to their 3rd period class). We will be able to begin receiving students as early at 9:15 am. There will be no Lion’s Den early drop-off on Monday. This decision for a late start was made with our students’ and their families’ safety in mind. While the storm is moving out of the area, the concern is that some of the low lying areas in York County will begin flooding throughout the evening and night (we are presently in a flash flood warning). This could make for hazardous driving conditions in the early morning while it is still dark outside. The two hour delay will allow for it to be light outside so drivers will be able to more clearly see the roadways. Lions, I greatly appreciate all of your support during this time and we look forward to seeing everyone tomorrow by 10:00 am.